Piece together the garden of your dreams with this cacti-themed puzzle. You've collected enough to cover all the windowsills and counters, but is there such a thing as too many succulents? We think not. With this puzzle, you'll piece together the cacti garden of your dreams. 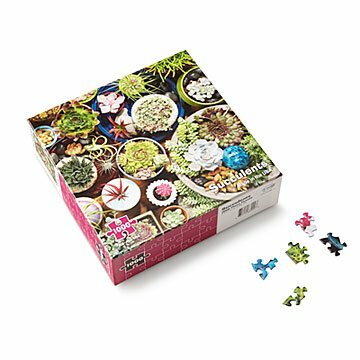 Featuring a variety of colors and textures, each of the 1,000 pieces makes for a green thumb-worthy game. Made from recycled materials in Tipton, Indiana. Product came as promised. Looks great, no pieces missing. The pieces themselves were interestingly shaped, and the photo was colorful and diverse to look at - not like many boring puzzles I've done in the past. Took us about 2 days. Fun puzzle. Good balance of doable but not too easy. Pretty picture. Mother hasn't started it yet but looking forward to soon. My mom loved this puzzle. It was unique, pretty, and challenging. My mom is an avid gardener and puzzler (is that a thing?) so this was a perfect gift for her. Puzzles are classics and always fun to give . Handy and fun to whip out when you want some fun time. I gave this to a friend as a gift. She loves puzzles and this one was challenging.